Yesterday was the first day back at college and of course I'm all prepared the night before yet forget one simple thing in the morning. My tumbler! I always carry one with me whenever I go to school or work and fill it up with coffee or other drinks in order to quench my thirst. Of course I ended up feeling like death the whole day because I was so dehydrated but I learned my lesson. Now, if I only I could choose which tumbler to buy next! The "But First Coffee" seems so eye-catching and a perfect conversation-starter especially in these new classes that I'm taking where I don't know most of my classmates. Everyone loves coffee so I'm sure it would be a big hit! But then again the Lilly Pulitzer and Kate Spade ones are classics and perfect for a girly-girl like me. Decisions, decisions. Which ones your favorite? What are some other college essentials that you love? 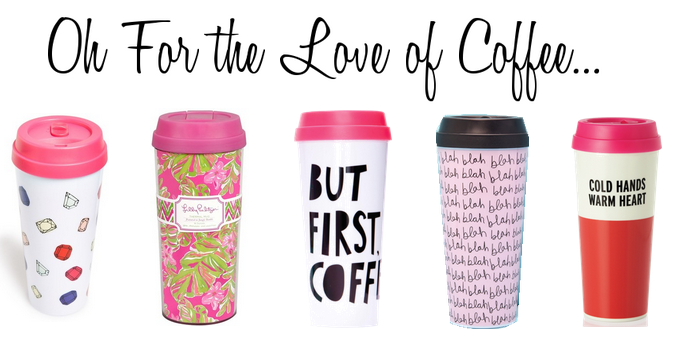 I love the "But First Coffee" mug I guess because I've seen it around so much but I just gotta have it! An essential for me would have to be my laptop like I have to carry it around everywhere lol!